It doesn’t hit theaters until Christmas Day, but with the Olympics currently in full swing, Universal found it to be prime time to reveal the first trailer for Unbroken. Angelina Jolie‘s sophomore directorial effort follows Olympian and war hero Louis “Louie” Zamperini (Jack O’Connell) who, along with two other crewmen, survived in a raft for 47 days after a near-fatal plane crash in WWII — only to be caught by the Japanese Navy and sent to a prisoner-of-war camp. This first trailer, which just premiered on NBC, mixes in interviews with our hero as well as archival footage, but running at three minutes, it also features a substantial first look at the actual film. With a script by Joel and Ethan Coen (as well as Richard LaGravenese), along with cinematography from Roger Deakins, it looks like a promising survival story, if not a bit too awards-baity. Also starring Domhnall Gleeson, Garrett Hedlund, Finn Wittrock, John Magaro, Jai Courtney, Alex Russell, and Miyavi, check it out below. 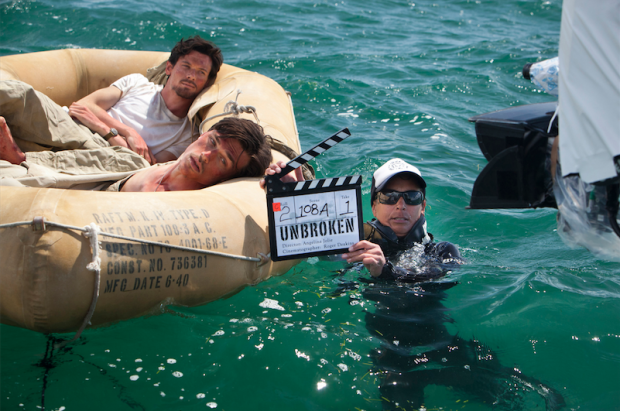 Unbroken hits theaters on December 25th, 2014.